A large Mediterranean experience is set for Artist Incubation’s Dinner on the Lake. From the complimentary menu to the music. 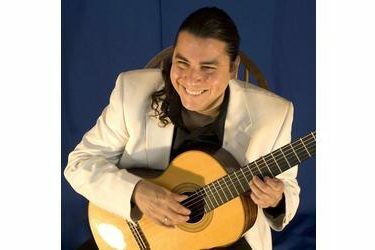 Each year Edgar Cruz performs more than 200 concerts and has played throughout America, Europe and South America. He has been a headliner at the prestigious Chet Atkins Guitar Festival every July in Nashville since 1995 and is a strong icon at major festivals in Oklahoma. Those who have witnessed Cruz’s performance immediately become entranced at the precision, speed and complexity with which his fingers strike the strings of his guitar to create a symphony of sound unusual to just one instrument. Cruz offers an incredible live repertoire of the greatest hits of the guitar, such as “Malagueña,” “Classical Gas,” “Bohemian Rhapsody,” “In the Mood,” “Dueling Banjos,” “Hotel California,” a classical medley, Latin favorites, originals and medleys on the fly. His You Tube video of “Bohemian Rhapsody” has more than 14,000,000 hits worldwide. Tickets are limited, and returning patrons are encouraged to contact Artist Incubation for first right of refusal.